Was that a mouthful enough for you? I feel like this is kind of an awkward time of year for produce. I mean some of us are skirting towards Spring and the rest of you are buried under like 90 inches of snow and ice (sorry guys). It’s too late to really be cooking with squashes and other fall vegetables, but the Spring produce hasn’t really showed up yet. It’s kind of random and a little bit depressing when I look at what I have been throwing in my produce cart. I am sincerely trying to be even healthier than usual as the threat of the end of elastic pants and enormous knit sweaters that no one can see your body under season is nearing it’s end. You know what I mean? So salads like this are going to be seen a little more frequently than usual around here that ok with you? 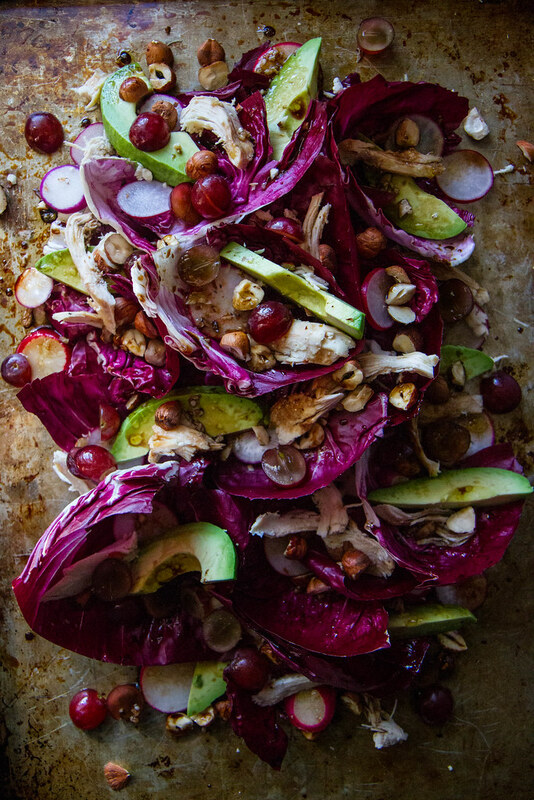 Arrange the Raddichio on a serving platter and add the avocado, chicken breast, grapes and hazelnuts. In a small bowl, whisk together the Balsamic Honey Vinaigrette ingredients and season to taste with kosher salt. 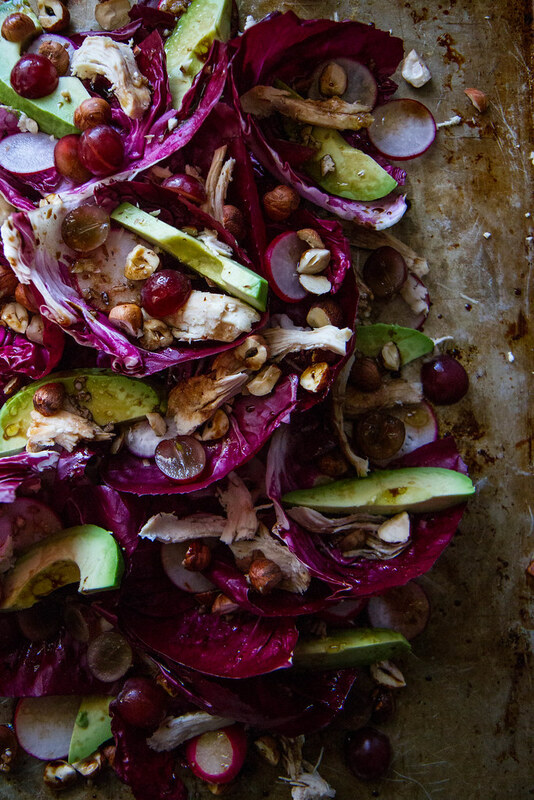 Drizzle the salad with the vinaigrette and serve immediately. Mm what a fantastic combination! I love chicken and grapes! That’s ok with me…I am the one buried under the 90 inches of snow (not really, its only about 50) but yes, the comfort food that I put in my mouth is starting to show up below! eeks! Have a great weekend…oops, gotta go, it’s snowing again…………………………. I was so excited to see this gorgeous salad! I’ve got a head of raddichio in the fridge right now and couldn’t decide what to do with it! I love that you pair some sweetness with it…this sounds wonderful! Lovely images! Oh yeah, I’m in the “90 inches of snow” category right now. Ugh. This beautiful salad is cheering me up though! Have a great weekend, Heather! It kinda is an awkward time of the year for produce but you made the most of it!! This is my kind of salad! Gorgeous! This looks fantastic Heather! Lovely!